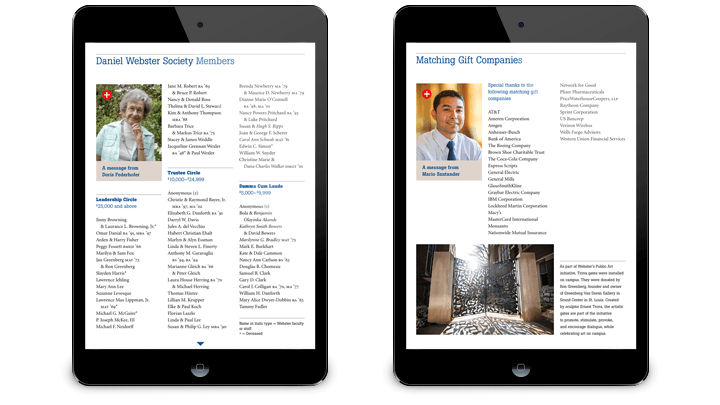 DPCI provided Adobe Digital Publishing Suite consulting services to assist Webster University with the creation of an application for iOS, Google Play and Amazon Kindle Fire tablet devices. Webster University, founded in 1915 with its home campus based in St. Louis, Missouri, is the only Tier 1, private, nonprofit university with campus locations around the world including metropolitan, military, online and corporate, as well as American-style traditional campuses in North America, Europe, Asia and Africa. Webster University’s mission is bold and appropriate for an increasingly global world. Webster University, a worldwide institution, ensures high-quality learning experiences that transform students for global citizenship and individual excellence. The Global Marketing and Communications department sought to find a solution that would enable the delivery of digital content, globally, to prospective, current, and alumni students in an innovative and cost-effective way. It was imperative that the new solution integrated with the University’s current content creation workflow and offered various features such as social sharing and web viewing. After careful consideration, the Adobe Digital Publishing Suite Enterprise Edition was chosen to satisfy the University’s needs. The staff members of the Global Marketing and Communications department recognized that with new technology comes new learning and elected to contract DPCI for Adobe DPS consulting and training services. DPCI created a custom curriculum that included DPS strategy consulting, project roadmap documentation, onsite InDesign training and app setup & publishing support. To kick-off the engagement, DPCI met with the department stakeholders to clarify the requirements for the first Webster University DPS app. DPCI consultants listened to the key objectives and provided recommendations based on the current workflow, DPS features, and app store guidelines. 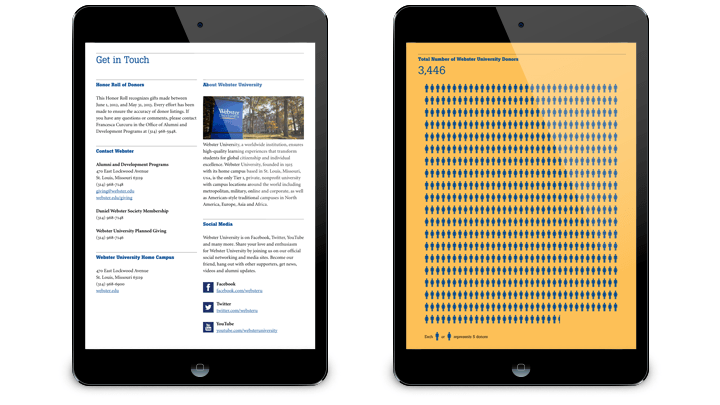 As a result, DPCI produced a roadmap that captured key milestones for the Webster University’s short and long term digital publishing goals. DPCI guided the department stakeholders through the end-to-end process for publishing the app including DPS Folio Producer administration, Apple and Android certificate creation, DPS App Builder configuration, and app submission to the Apple, Google Play, and Amazon Mobile app stores. Prior to submitting the apps for approval, DPCI conducted quality assurance and performance testing to confirm that all folio content functioned properly on the intended devices. With DPCI’s help, Webster University launched its self-entitled app on Apple, Google Play, and Amazon Mobile app stores in December 2013. The first folio included in the app paid homage to donor’s who have contributed to the University over the years. The Webster University team is now confident with the Adobe Digital Publishing Suite solution and looking forward to the release of its next digital app which is slated for release this upcoming fall.